There’s never been a movie series like the FAST & FURIOUS films. The original movie was a minor hit in 2001, but fandom for the car-racing outlaws played by Vin Diesel and Paul Walker steadily grew. The fourth film became a blockbuster in 2009 — and the franchise is now a $5 billion enterprise. The first spinoff, FAST & FURIOUS PRESENTS: HOBBS & SHAW, opens in August, with Dwayne “The Rock” Johnson and Jason Statham in the lead roles. This one looks to push the insane action and crazy comedy of the series to even greater heights. Here’s everything we know about HOBBS & SHAW. The first FAST & FURIOUS spinoff, HOBBS & SHAW, is set to open on August 2. For the past decade, films in the series have opened in April and May, so the August date is a change — but these guys are up to the challenge. That weekend will be the debut of DORA THE EXPLORER and THE NEW MUTANTS. While the DORA audience probably won’t be a big crossover with HOBBS & SHAW, Fox’s X-Men spinoff could provide some competition. Is There a Hobbs & Shaw Trailer? Yes! It just arrived on February 1. This trailer is completely insane. It looks, frankly, like a version of STEP BROTHERS starring Dwayne Johnson and Jason Statham — and that’s pretty fantastic. Check out the footage above, pick your jaw up off the floor and come back to us. 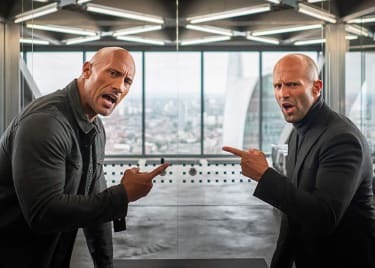 Who Directed Hobbs & Shaw? David Leitch directed the FAST & FURIOUS spinoff, from a script by Chris Morgan. Leitch just made DEADPOOL 2, and before that he did ATOMIC BLONDE and was half of the directorial team on JOHN WICK. Prior to becoming a director, Leitch was best known as a stuntman, stunt coordinator and second unit director. The comedic sensibilities of DEADPOOL 2 have pretty clearly seeped into this movie, too. Massively muscled Diplomatic Security Service lawman Hobbs (Johnson) and outcast outlaw turned friendly operative Shaw (Statham) have been at each other’s throats since first crossing paths in 2015’s FURIOUS 7. Now, a biotechnological threat controlled by a superhuman terrorist named Brixton (Idris Elba) is powerful enough to get these two tough pros to team up. Just because they have to work together doesn’t mean their rivalry has gone away. 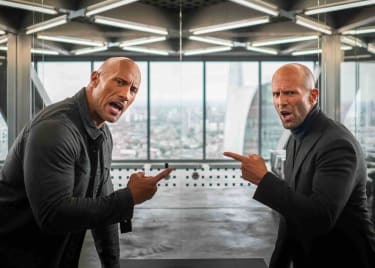 So, Hobbs and Shaw are constantly working to one-up one another as they race to battle Brixton. Complicating matters is that the bad guy (he actually calls himself a bad guy!) has already targeted Shaw’s sister, Hattie, a brilliant MI6 agent. The action-packed film races all over the globe, from Los Angeles to London, to the nuclear site of Chernobyl and the beautiful island of Samoa, which Hobbs calls home. Naturally, Dwayne “The Rock” Johnson steps back into the shoes of Luke Hobbs. He walked into the series in FAST FIVE and has been an important part of the storyline ever since. His character in this film is pushed even further than we’ve seen him in previous films in the series, taking more advantage of The Rock’s comedic skills. Jason Statham plays Deckard Shaw, who first appeared in the mid-credits scene in FAST & FURIOUS 6. This character is kind of complicated, because that mid-credits scene connects to TOKYO DRIFT, in which Sung Kang’s character, Han, was introduced — and killed. As it turns out, the third film in the series follows the sixth, chronologically. At the end of FAST & FURIOUS 6, Han heads to Tokyo, where the events of TOKYO DRIFT take place — and where Deckard is responsible for Han’s death. So, Deckard is a divisive character. Fans loved Han, so having a new villain connected to his death was significant. But then the most recent film, FATE OF THE FURIOUS, turned Deckard into a hero and ended with him being accepted by Dom’s family. Seeing the guy who killed Han hanging out with Han’s friends didn’t sit well with some fans. All of which is a long way to say that HOBBS & SHAW is a chance to redeem the character. All of these characters need a proper villain to fight, and that’s where Idris Elba comes in. He plays Brixton, an international terrorist leader and “cyber-genetically enhanced anarchist” who wants to do really bad things to humanity. Are There Other Fast & Furious Spinoffs? There could be! In January 2019, Vin Diesel announced a film that will be led by women from the FAST & FURIOUS films. We don’t know much about this one, but Nicole Perlman, Lindsey Beer and Geneva Robertson-Dworet are writing the film. In that same Instagram announcement, Diesel said there are three spinoffs in development. Presumably, HOBBS & SHAW is the first and the one led by women from the series is the second, which leaves a third unknown. Rewind to 2016, between the releases of FAST & FURIOUS 6 and FURIOUS 7, when Vin Diesel announced that the ninth and 10th films in the series would be released on April 10, 2020 and April 2, 2021. Neither of the films have official titles yet, but in January 2019, Vin Diesel said “the next chapter” would begin shooting in London in February 2019. He referenced #FAST9, so that’s what we’ll call the movie for now. The big change for FAST 9 is the screenwriter. Daniel Casey is writing the film. Chris Morgan has written the entire series — including HOBBS & SHAW — since his first entry, TOKYO DRIFT. Bringing in a new writer at this point is a big deal. On the other hand, Justin Lin is said to be directing — he directed all of the films from TOKYO DRIFT to FAST & FURIOUS 6. So, he and the cast will keep the series tethered to its roots. How Long Will the Fast & Furious Series Run? Back in 2016, Vin Diesel suggested that the ninth and 10th films would be the last in the main series. We’ll have to wait to see if that holds true. But since there are already two spinoffs in the works, FAST 10 (or whatever the movie is called) won’t necessarily be the end of the road. 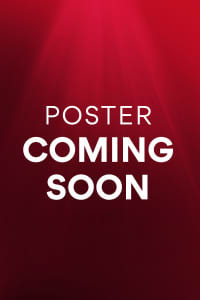 Check back with the AMC® Scene soon for more info on HOBBS & SHAW and the FAST & FURIOUS series!